This article is a fresh interpretation of a subducting slab of sea bottom and the impact of water release in three different zones of transition. I find it remarkable that it was possible to image the behavior using electromagnetic waves. This strongly suggests that we might eventually have a detailed mapping of the subsurface or at least a mapping of the zones of water alteration. The ability to presently model the active edges of the Ring of Fire leads to complacency regarding everything else. This is still a young science that was woefully astray before plate tectonics. The ring of fire it self surrounds slightly less than half the globe. Quite possibly the opening of the Atlantic produced crustal failure more or less on a North South equator and as the spreading opened up the Atlantic, the equatorial ring has been shrinking. Thus the perimeter formed by the Ring of Fire has absorbed an area equal to that created in the Atlantic. Assuming that it has not been significantly absorbed elsewhere it follows that we can write an equation of curvature compression for the ring with an known value on one side of the equation. Thus we can develop our knowledge of Ring of Fire tectonics in quite small subsections and reasonably go looking for missing mass and the like. I do not know if anyone has tried to do this yet but it would be neat to take it in thousand mile by thousand mile chunks to see where it all leads. This illustration shows a cross section of the Earth beneath New Zealand's South Island. This is one of the planet's youngest subduction zones, where the Pacific Plate collides with the Australian Plate and "subducts" or dives beneath it. The illustration, based on actual data from a University of Utah study, shows five places where water (lime green, yellow and reddish colors) is rising from the subduction zone to help pave the way for earthquakes, either by triggering quakes on steep thrust faults (far left), accommodating the motion of strike-slip faults like the Alpine fault and other faults (center and right) or by creating new faults or widening them (far right). Credit: Philip Wannamaker and Doug Jensen, University of Utah. New Zealand is the site of one of the world's youngest subduction zones, where the Pacific Plate of Earth's crust dives beneath the Australian Plate. Now, a University of Utah study shows how water deep underground helps the subduction zone mature and paves the way for it to generate powerful earthquakes. The study in the journal Nature "expands our understanding of the sources of earthquake failure," says Phil Wannamaker, the study's main author and a geophysicist at the University of Utah's Energy and Geoscience Institute. "It hasn't been on people's minds that fluid-generating processes way out of sight reach up and cause damage right under our feet," he adds. Understanding how one of Earth's moving tectonic plates can dive or subduct beneath another to create earthquake-generating faults is important because subduction and faulting "are major processes all over the world," especially in the "Ring of Fire" around the Pacific Ocean, Wannamaker says. Wannamaker conducted the study with University of Utah geophysics student Virginie Maris; geophysicists George Jiracek of San Diego State University and Yasuo Ogawa of the Tokyo Institute of Technology; and five coauthors from New Zealand's government geology institute, GNS Science: geophysicists T. Grant Caldwell, Hugh Bibby and Wiebke Heise; student Graham Hill; and field technician Stewart Bennie. Wannamaker says the study was financed by a $395,000 grant from the National Science Foundation. With additional funding from Japan and from the New Zealand Foundation for Research, Wannamaker estimates the total study cost at $600,000. New Zealand includes two major islands - the North Island and less populated South Island - that extend roughly northeast to southwest in the Pacific Ocean southeast of Australia. Like other nations along the Pacific "Ring of Fire" - including the western coast of North America - New Zealand sits atop a boundary between two of Earth's slowly moving tectonic plates, and thus has earthquakes and volcanism. The plates, which can be 100 miles thick, include Earth's crust and the upper part of the mantle, the rock layer beneath the crust. New tectonic plates are born as volcanic eruptions at mid-ocean ridges add new rock to the plates on both sides of the ridges, like twin conveyor belts moving away from a ridge. At the other end of these conveyor belts, where an oceanic plate collides with a continental plate, the seafloor plate subducts - or dives downward at a roughly 45-degree angle - beneath the continental plate, a process that generates earthquakes and volcanism. New Zealand's subduction zone - the Hikurangi subduction zone - is considered young because only during the past 20 million years did the edge of the Pacific Plate collide with the Australian Plate in New Zealand and begin diving beneath it. The zone includes two kinds of quake-generating motions because the Pacific Plate is colliding with the Australian Plate at New Zealand at an angle instead of head-on. 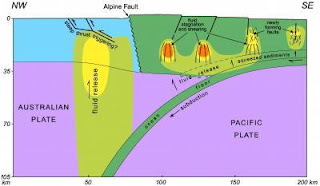 Thus, the Pacific Plate not only is moving northwest and diving under the Australian Plate, but it also is sliding southwest under the Australian Plate at the same time. So while the colliding plates create quake forces like those seen in other subduction zones such as the U.S. Pacific Northwest, the oblique movement also generates "strike-slip" pressures like those that created California’s San Andreas fault. The oblique pressure has created four major strike-slip faults extending northeast to southwest along the length of the northern part of the South Island. Major earthquakes to nearly magnitude 8 have occurred along these and related faults over the past 200 years. Rocks exposed from old, defunct subduction zones as well as current "Ring of Fire" volcanic rocks show water is released during subduction, so the researchers wanted to determine the role of this water in the maturation of the young subduction zone. They used a method called magnetotelluric sounding, which is similar to using X-rays for CAT scans of patients and seismic waves to search for oil and gas. Magnetotelluric sounding uses natural electromagnetic waves generated by the sun and by lightning bolts. Most such waves travel through the air, but "a portion penetrate the Earth, scatter off rock structures of interest and return to the surface, where we can measure them" using fancy volt meters, Wannamaker says. As the electromagnetic waves pass through Earth's interior, they travel faster or slower depending on the extent to which rock and other material conducts or resists electricity. Water is more conductive, so it can be detected by this technique. During 2006 and 2007, Wannamaker and colleagues made measurements at 67 sites along a 125-mile line crossing the northern end of New Zealand's South Island. Patterns of backscattered electromagnetic radiation from all the stations then were assembled by a computer program to create an image of Earth's crust and upper mantle along a cross section of New Zealand's South Island. Beneath the South Island's eastern coast, where the Pacific Plate begins to dive under the Australian Plate, water is released about 10 miles underground. It comes from seafloor sediments that are squeezed as they are carried underground on the subducting Pacific Plate. Much of the water rises upward into the overlying crust of the Australian Plate, cracking the crustal rock further to create and widen existing cracks. This "mesh" of fault fractures "is weakening the crust and promoting the formation of new strike-slip faulting," Wannamaker says. Farther west, water is released from hydrated rock - rock with chemically bound water - within the subducting Pacific Plate. The water collects within cracks roughly 6 to 20 miles underground in the "ductile" or taffy-like part of the Earth's crust. Such fluids help accommodate the oblique or southwesterly motion of the Pacific Plate under New Zealand - motion that created the strike-slip faults on the South Island. "These fluids certainly could burst upward into the strike-slip zone and trigger major earthquakes," Wannamaker says. "And many smaller quakes have been centered along the edges of these reservoirs." The largest accumulation of water beneath the subduction zone also is the deepest and farthest west beneath the South Island. Freed by the action of heat and pressure on hydrated minerals, the water forms a huge plume extending upward from depths of 60 miles or more - something also seen in older, more mature subduction zones. It appears these fluids trigger major earthquakes - and did so during magnitude-7 and larger earthquakes in the Murchison area in the early 20th century, Wannamaker says. Faults in that area are high-angle thrusts, meaning that during quakes, ground on one side of the fault moves up and over the ground on the other side. Laws of rock mechanics say such faults should not rupture when they are steep, because it is difficult to push one block of ground up and over the other when the fault between them dips at an angle of more than 30 degrees - unless water is present. Yet big quakes near Murchison have occurred on faults that dip at angles of more than 55 degrees, Wannamaker says. That suggests subduction zone water makes quakes possible on such steep faults. "The fluid pressure is rising through the upper mantle and deep crust and into the upper crust, and props open the high-angle thrusts, allowing them fail," Wannamaker says. In older subduction zones - including the zone off New Zealand's North Island - the water from great depths moves largely straight upward into the hot upper mantle, lowering the melting temperature of the rock and ultimately leading to the formation volcanoes on the land above. Subduction has not yet injected the upper mantle with enough water to trigger volcanism on the South Island, Wannamaker says.